I found it interesting the other day, walking with new friends, that they had never heard of Terry Fox. As a Canadian, we are taught about Terry Fox’s worldwide legacy, so I somehow expected that those affected by Breast Cancer (and activists within the breast cancer community) would have at least heard of him. Terry Fox is a Canadian hero after all. The annual Terry Fox Run (today in Canada – although it is an international event) is the world’s largest one-day fundraiser for cancer research (according to Wikipedia). I don’t know if it is because of my age, but those of my generation (and older) actually remember when Terry Fox was running across Canada in his Marathon of Hope. And I remember the sad emotions associated with the day that Terry had to stop his run because his cancer had returned. 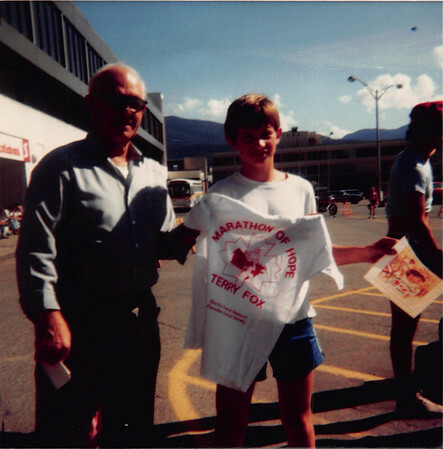 Although I don’t remember doing any Terry Fox run’s myself, I do remember picking up my brother after he did the run one September back when I was still in elementary school (not sure what year this was – but early 80s – so picture was taken at one of the first Terry Fox runs). Terry’s journey was done at a time before cause marketing was a big thing – actually, in doing some more reading about it, Terry Fox actually turned down opportunities for corporate sponsorship. Today, when “pinkwashing” is a huge issue, it is nice to see that the annual Terry Fox Run is still run without any corporate sponsorships. Note that I don’t think cause marketing is a bad thing. Cause marketing helps a lot of charities raise a lot of money – when done right it is a ‘win-win’ for both the corporate sponsor and the charity – and honestly, it is a lot better than nothing – which in many cases is the alternative. Terry’s journey continues to inspire school children and adults alike (may schools also do Terry Fox runs in early September every year). One of the most touching notes I received when I was first diagnosed with breast cancer was when a friend said that her 5 year old daughter said she would do the Terry Fox run for me. As I write, it still brings tears to my eyes. You can donate directly the Terry Fox Foundation at http://terryfox.org/. 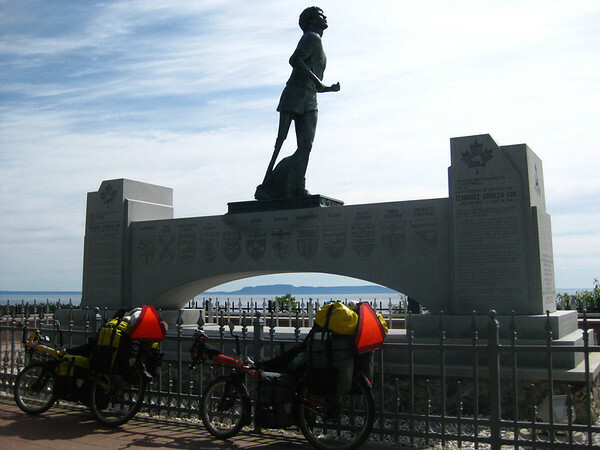 The picture above was taken at the Terry Fox memorial just east of Thunder Bay Ontario on our Going East bike tour. It marks the spot where Terry had to end his Marathon of Hope.